The content, organization, graphics, design, compilation, magnetic translation, digital conversion and other matters related to the Site are protected under applicable U.S. and international copyright, trademark and other proprietary (including but not limited to intellectual property) rights. “SUN-MAID” and others marks are either trademarks or registered trademarks of Sun-Maid. Other products, company names, and content displayed on the Site may be the trademarks or copyrights of their respective owners. Individual documents on this server may have different copyright conditions, and that will be noted in those documents. The copying, redistribution, use or publication by You of any such matters or any part of the Site, except as allowed by this Agreement, is strictly prohibited. You do not acquire ownership rights to any content, document or other materials viewed through the Site. The posting of information or materials on the Site by Sun-Maid does not constitute a waiver of any rights in such information and materials. The viewing, printing or downloading of any content, graphic, form or document from the Site grants You only a limited, nonexclusive license for use solely by You for Your own personal use and not for republication, distribution, assignment, sublicense, sale, preparation of derivative works or other use. You shall keep all trademark, copyright and proprietary notices intact. No part of any content, form or document may be reproduced in any form or incorporated into any information retrieval system, electronic or mechanical, other than for Your personal use (but not for resale or redistribution). We reserve the right in our sole discretion to edit or delete any documents, information or other content appearing on the Site at any time without notice. If You send submissions or creative suggestions, ideas, notes, drawings, concepts, or other information (collectively, the “Submissions”), the Submissions shall be deemed, and shall remain, the property of Sun-Maid. None of the Submissions shall be subject to any obligation of confidence on the part of Sun-Maid, and Sun-Maid shall not be liable for any use or disclosure of any Submissions. You hereby represent and warrant that You have all necessary rights in and to the Submissions You provide and that all information they contain shall not infringe any proprietary or other rights of third parties, or contain any libelous, tortuous, or otherwise unlawful information. In addition, You warrant that all so-called moral rights in any Submissions You provide have been waived. Without limitation of the foregoing, Sun-Maid shall exclusively own all known or hereafter existing rights to the Submissions of every kind and nature and shall be entitled to unrestricted use of the Submissions for any purpose whatsoever, commercial or otherwise, without compensation to the provider of the Submissions. Sun-Maid does not endorse and has no control over the content of Submissions submitted by others to the Site. Submissions submitted to the Site are not necessarily reviewed by Sun-Maid prior to posting and do not necessarily reflect the opinions or policies of Sun-Maid. Sun-Maid makes no warranties, express or implied, as to the content of the Submissions on the Site or the accuracy and reliability of any Submissions and other materials on the Site. Nonetheless, Sun-Maid reserves the right to prevent You from contributing Submissions to the Site and to edit, change and/or remove such Submissions for any reason whatsoever without prior notice. Through your use of the site and making of a submission for information you authorize us to provide the information contained in your submission to third parties who may contact you at your request by telephone, e-mail or otherwise even if you have previously requested that you be placed on a Do Not Call registry. Your Submissions via www.sunmaid.com, contacting Sun-Maid via electronic mail, by postal services, by land line, mobile telephone directly or indirectly, constitutes a waiver due to your request for telephone and other contact and renders Sun-Maid exempt from any complaints, causes of action or rights to file a law suit available, in a state court, federal court or before any appropriate agency including the Federal Trade Commission (FTC) or the Federal Communications Commission (FCC), otherwise available to You under Your state Do Not Call law and the national Do Not Call statue which went into effect in January 2004. See the Telemarketing Sales Rule: Final Rule, 68 Fed. Reg. 4580-4679 (January 29, 2003)., and the Revised Final Amended Telemarketing Rule at http://www.ftc.gov (effective January 1, 2005). You agree to defend, indemnify and hold harmless Sun-Maid, its affiliates and their respective directors, officers, employees and agents (collectively, “Affiliated Parties”) from and against any and all claims, actions, suits or proceedings, as well as any and all losses, liabilities, damages, costs and expenses (including reasonable attorneys fees and costs) arising out of or accruing from: (a) any material posted or otherwise provided by You that infringes any copyright, trademark, trade secret, trade dress, patent or other intellectual property right of any person or defames any person or violates their rights of publicity or privacy; (b) any misrepresentation made by You in connection with Your use of the Site; (c) any non-compliance by You with the terms and conditions of this Agreement; and (d) claims regarding any liability, loss, claim and/or expense arising from or related to Your access and use of the Site, including information obtained through the Site. Notwithstanding the foregoing, Sun-Maid reserves the right to assume at its expense the exclusive defense and control of any matter subject to indemnification by You, in which event You will fully cooperate with Sun-Maid in asserting any available defenses. Information on this Site may contain technical inaccuracies or typographical errors. Information may be changed or updated without notice. Sun-Maid may also make improvements and/or changes in the products and/or services described in this information at any time without notice. THE INFORMATION FROM OR THROUGH THE SITE IS PROVIDED “AS IS,” “AS AVAILABLE,” AND ALL WARRANTIES, EXPRESS OR IMPLIED, ARE EXPRESSLY DISCLAIMED (INCLUDING, BUT NOT LIMITED TO, THE DISCLAIMER OF ANY IMPLIED WARRANTIES OF MERCHANTABILITY AND FITNESS FOR A PARTICULAR PURPOSE). THE INFORMATION AND SERVICES MAY CONTAIN BUGS, ERRORS, PROBLEMS OR OTHER LIMITATIONS. SUN-MAID AND ITS AFFILIATED PARTIES HAVE NO LIABILITY WHATSOEVER FOR YOUR USE OF ANY INFORMATION OR SERVICE. IN PARTICULAR, WE ARE NOT LIABLE FOR ANY FAILURE TO PERFORM OR PERFORMANCE DUE TO A FORCE MAJEURE EVENT. AS A LIMITATION THEREOF, WE AND OUR AFFILIATED PARTIES ARE NOT LIABLE FOR ANY INDIRECT, SPECIAL, INCIDENTAL OR CONSEQUENTIAL DAMAGES (INCLUDING DAMAGES FOR LOSS OF BUSINESS, LOSS OF PROFITS, LITIGATION, OR THE LIKE), WHETHER BASED ON BREACH OF CONTRACT, BREACH OF WARRANTY, TORT (INCLUDING NEGLIGENCE), PRODUCT LIABILITY OR OTHERWISE, EVEN IF ADVISED OF THE POSSIBILITY OF SUCH DAMAGES. THE NEGATION OF DAMAGES SET FORTH ABOVE IS A FUNDAMENTAL ELEMENT OF THE BASIS OF THE BARGAIN BETWEEN US AND YOU. THIS SITE AND THE INFORMATION WOULD NOT BE PROVIDED WITHOUT SUCH LIMITATIONS. NO ADVICE OR INFORMATION, WHETHER ORAL OR WRITTEN, OBTAINED BY YOU FROM US THROUGH THE SITE SHALL CREATE ANY WARRANTY, REPRESENTATION OR GUARANTEE NOT EXPRESSLY STATED IN THIS AGREEMENT. ALL RESPONSIBILITY OR LIABILITY FOR ANY DAMAGES CAUSED BY VIRUSES CONTAINED WITHIN THE SITE IS DISCLAIMED. WE WILL NOT BE LIABLE TO YOU FOR ANY INCIDENTAL, SPECIAL OR CONSEQUENTIAL DAMAGES OF ANY KIND (INCLUDING LOST PROFITS) THAT MAY RESULT FROM USE OF, OR INABILITY TO USE OUR SITE. SUN-MAID DOES NOT WARRANT OR MAKE REPRESENTATION REGARDING THE USE OR THE RESULTS OF THE USE OF THE MATERIALS IN THIS SITE IN TERMS OF THEIR CORRECTNESS, ACCURACY, RELIABILITY OR OTHERWISE. OUR MAXIMUM LIABILITY TO YOU UNDER ALL CIRCUMSTANCES WILL BE EQUAL TO THE PURCHASE PRICE YOU PAY, IF ANY, FOR THE GOODS, SERVICES AND/OR INFORMATION PROVIDED FOR THE THREE (3) MONTHS PRECEEDING THE ACTION OR INACTION THAT CAUSED HARM. If You have agreed to allow Your minor child, or a child for whom You are legal guardian (a “Minor”), to use this Site, You agree that You shall be solely responsible for: (a) the online conduct of such Minor; (b) monitoring such Minor’s access to and use of the Site; and (c) the consequences of any use of the Site by such Minor. We allow access to or advertise third-party merchant sites (“Merchants”) from which You may purchase certain goods or services. You understand that we do not operate or control the products or services offered by Merchants. Merchants are responsible for all aspects of order processing, fulfillment, billing and customer service. We are not a party to the transactions entered into between You and Merchants. YOU AGREE THAT USE OF SUCH MERCHANTS IS AT YOUR SOLE RISK AND IS WITHOUT WARRANTIES OF ANY KIND BY US, EXPRESS, IMPLIED OR OTHERWISE INCLUDING WARRANTIES OF TITLE, FITNESS FOR A PARTICULAR PURPOSE, MERCHANTABILITY OR NONINFRINGEMENT. UNDER NO CIRCUMSTANCES SHALL WE BE LIABLE FOR ANY DAMAGES (DIRECT OR INDIRECT) ARISING FROM ANY TRANSACTIONS BETWEEN YOU AND MERCHANTS OR FOR ANY INFORMATION APPEARING ON MERCHANT SITES OR ANY OTHER SITE LINKED TO OUR SITE. The inclusion of third-party advertisements on the Site does not imply any recommendation, approval, or endorsement by Sun-Maid of the quality of the goods/services being advertised or any other characteristics or qualities of the Merchant or its goods/services. You expressly agree not to rely on any claims made on this Site regarding the quality of the goods/services being advertised. To the extent desired, you shall perform all reasonable inquiries into the quality, sufficiency, legality, fitness, and ability of the Merchant goods/services to meet your needs. Merchant has no power to bind Sun-Maid in any way, including but not limited to issues regarding warranties, adequacy of goods, and all other concerns. You represent and warrant that if You are purchasing something from us or from Merchants that: (i) any credit information You supply is true and complete; (ii) charges incurred by You will be honored by Your credit card company; and (iii) You will pay the charges incurred by You at the posted prices, including any applicable taxes. The Site contains links to other websites. We are not responsible for the content, accuracy or opinions expressed in such websites, and such websites are not investigated, monitored or checked for accuracy or completeness by us. Inclusion of any linked website on our Site does not imply approval or endorsement of the linked website by us. If You decide to leave our Site and access these third-party sites, You do so at Your own risk. a) A physical or electronic signature of a person authorized to act on behalf of (1) the owner of an exclusive right that is allegedly infringed or (2) the person defamed. b) Identification of the copyrighted work claimed to have been infringed, or, if multiple copyrighted works at a single online site are covered by a single notification, a representative list of such works at the site. Similarly for other types of infringing materials, a list of such materials. c) Identification of the material that is claimed to be infringing, to be the subject of infringing activity, or that is claimed to be defamatory and that is to be removed or access to which is to be disabled, and information reasonably sufficient to permit us to locate the material. d) Information reasonably sufficient to permit us to contact You, such as Your address, telephone number, and/or electronic mail address. e) A statement that You have a good faith belief that use of the material in the manner complained of is not authorized by the copyright or other proprietary right owner, its agent, or the law. f) A statement that the information in the notification is accurate, and under penalty of perjury, that You are authorized to act on behalf of the owner of an exclusive right that is allegedly infringed or on behalf of the person defamed. The Site may contain information and press releases about us. While this information was believed to be accurate as of the date prepared, we disclaim any duty or obligation to update this information or any press releases. Information about companies other than ours contained in press releases or otherwise, should not be relied upon as being provided or endorsed by us. This site does not provide medical or any other health care advice, diagnosis or treatment. The site and its services, including the information above, are for informational purposes only and are not a substitute for professional medical advice, examination, diagnosis or treatment. Always seek the advice of your physician or other qualified health professional before starting or changing any new exercise program or making a lifestyle change or making any changes to existing treatment. Do not delay seeking or disregard medical advice based on information on this site. Medical information changes rapidly and while Sun-Maid and its content providers make efforts to update the content on the site, some information may be out of date. Information provided intended for U.S. use. Sun-Maid or You may terminate this agreement at any time. You may terminate this agreement by destroying: (a) all materials obtained from all Sun-Maid sites, and (b) all related documentation and all copies and installations(together, the “Materials”). Sun-Maid may terminate this agreement immediately without notice if, in its sole judgment, you breach any term or condition of this agreement. Upon termination, you must destroy all materials. Except as described otherwise, all materials in the Sun-Maid site are made available only to provide information about Sun-Maid. Sun-Maid controls and operates this site from its headquarters in Kingsburg California, United States of America and makes no representation that these materials are appropriate or available for use in other locations. If you use this site from other locations you are responsible for compliance with applicable local laws. This Agreement is governed and be interpreted pursuant to the laws of the State of California, United States of America, notwithstanding any principles of conflicts of law. Any dispute arising from the subject matter of this Agreement shall be adjudicated in the federal or state courts located in Fresno County, California. If any part of these Terms and Conditions is unlawful, void, or unenforceable, that part will be deemed severable and will not affect the validity and enforceability of any remaining provisions. Possible evidence of use of this site for illegal purposes will be provided to law enforcement authorities. 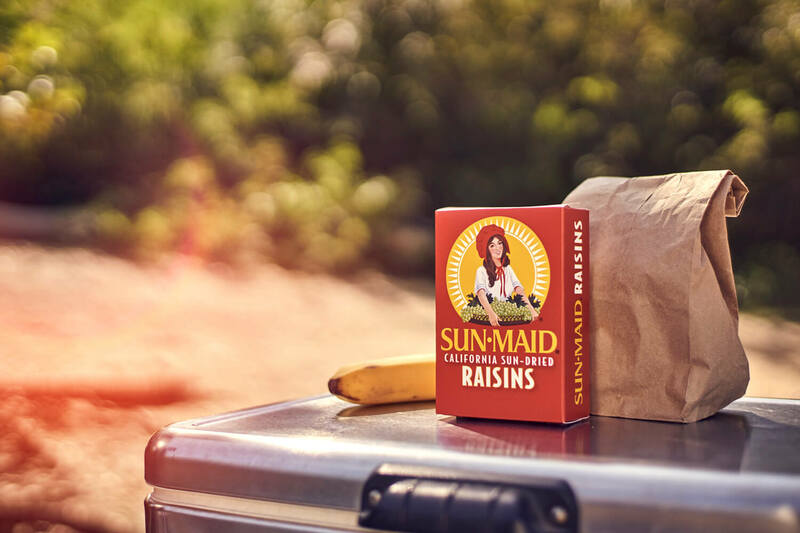 Unless otherwise specified, the materials on this Site are presented solely to provide information regarding and to promote Sun-Maid’s Site and other products available in the United States, its territories, possessions and protectorates. Sun-Maid makes no representation that materials on this Site are appropriate or available for use outside the United States. Those who choose to access this Site from outside the United States do so on their own initiative and are responsible for compliance with local laws, if and to the extent that local laws are applicable. Software from this Site is further subject to United States and international export controls. No software from this Site may be downloaded or otherwise exported or re-exported (A) into (or to a national or resident of) Cuba, Libya, North Korea, Iran, Syria, or any other country to which the U.S. has embargoed goods, or (B) to anyone on the U.S. Treasury Department’s list of Specially Designated Nationals or the U.S. Commerce Department’s Table of Deny Orders or to any other prohibited parties. By using the Site, You represent and warrant that You are not located in, under the control of, or a national or resident of any such country or on any such list. Information Sun-Maid publishes on the World Wide Web may contain references or cross references to Sun-Maid products, programs or services that are not announced or available in your country. All disputes between You and Sun-Maid arising in connection with this Agreement shall be finally settled by binding arbitration administered by the American Arbitration Association under its Commercial Arbitration Rules, using the Expedited Procedures, and judgment on the award rendered by the arbitrator(s) may be entered in any court of competent jurisdiction. The arbitrator shall be an individual generally skilled in the legal and business aspects of the subject matter of this Agreement. The arbitrator shall have no authority to impose penalties or award punitive damages. The arbitration shall take place in the Fresno County, California, and the arbitrator shall apply the law of the State of California and applicable rules of evidence. If all parties and the arbitrator agree, arbitration may take place by telephone or by written communication. Unless the arbitrator otherwise directs, the parties, their representatives, other participants, and the arbitrator shall hold the existence, content, and result of the arbitration in confidence. No action, regardless of form, related to the obligations of the parties under this Agreement may be brought by either party against the other more than one (1) year after the cause of action has accrued. In any proceeding to enforce this Agreement, the prevailing party will have the right, in addition to its other rights hereunder, to recover its reasonable arbitration costs and reasonable attorneys’ fees. Notwithstanding the foregoing, Sun-Maid may seek immediate injunctive relief in the event of Your infringement of intellectual property rights hereunder or a breach of Your confidentiality obligations. To the extent that anything in or associated with the Site is in conflict or inconsistent with this Agreement, this Agreement shall take precedence. Our failure to enforce any provision of this Agreement shall not be deemed either a waiver of such provision or a waiver of the right to enforce such provision.